With the sharp, piquant spiciness of wasabi. 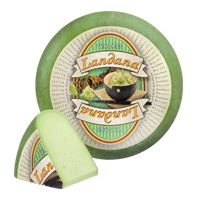 Landana WASABI is a mild Dutch cheese infused with hot wasabi. Anyone who knows wasabi knows that this spice from the Japanese cuisine can be very hot, but in mild Landana cheese this flavor is somewhat milder and therefore extremely tasty. 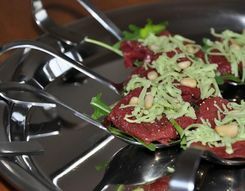 Aside from the cheese board, it is also delicious on rye bread and in various salads.